Count down the days until 2015 together with the OA-ICC! Each day of December you will find a short story on the OA-ICC news stream highlighting an ocean acidification project, effort, or resource. A large number of publications on ocean acidification by various international institutions and fora have seen light in the past decade. Re-discover some of them below. The Monaco Declaration of 2008, supported by H.S.H. Prince Albert II and signed by more than 150 scientists from 26 countries, laid the foundation for future multilateral action on ocean acidification. The “Guide to best practices on ocean acidification research and data reporting” (2010) represents a very useful tool for young scientists entering the field, as it is essential to ensure comparability of the vast amount of data generated and to achieve the highest possible data quality. It guides researchers through internationally agreed, tested and standardized protocols for observational and experimental approaches, carbonate chemistry manipulations and measurements, and data reporting. 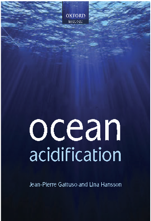 “Ocean Acidification” (2011), published by Oxford University Press, is the first comprehensive book on OA. Each of the book’s 15 chapters reviews a key topic of ocean acidification research and evaluates risks and uncertainties. The “20 facts about ocean acidification” (2013) targets scientists, scientific communicators and science policy advisers. It presents a summary of the current state of OA research and understanding in 20 key points. The brochure entitled “Economics of ocean acidification” (2013) was designed to provide policymakers with recommendations to prepare for social and economic impacts of ocean acidification on livelihoods, trade and food supply from ocean resources. It focuses on fisheries and aquaculture and regional aspects of species vulnerability and socio-economic adaptation. 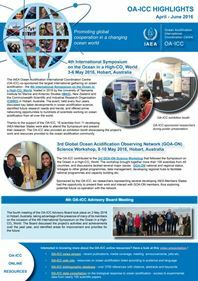 The “Ocean Acidification Summary for Policy Makers” (2013) presents a summary of the state of knowledge on OA based on the latest research presented at the Third Symposium on the Ocean in a High-CO2 World (Monterey, California, September 2012). It outlines policy considerations for mitigation and adaptation strategies, calls for international research coordination and stronger stakeholder engagements. “An Updated Synthesis of the Impacts of Ocean Acidification on Marine Biodiversity” (2014) published by the Secretariat of the Convention on Biological Diversity (CBD) offers a review on the impacts of OA on biodiversity and ecosystem functions. It presents complex scientific information on OA in a clear and understandable way and provides an important reference point for scientists, policy-makers and anyone else interested in understanding how ocean acidification affects our oceans and the vital services they provide. For many other relevant resources grouped according to audience and language, please go to the OA-ICC website!